When you enter the Park through the Artisan's Gate entrance, Dipway Arch is immediately visible in the distance. 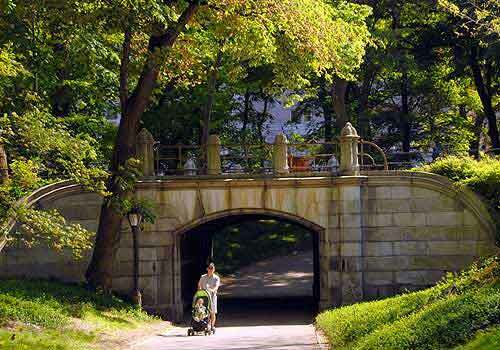 Set beneath the Park Drive and measuring more than 15 feet wide, the arch's underpass leads around Heckscher Playground and north toward the Carousel. Designed by Calvert Vaux, the arch was created with a variety of stone textures. Its blue-gray granite surface is set in even segments of ashlar, alternating with bush-hammered blocks. Its most distinguishing feature is the curved granite detail that sweeps along its abutments. Passing beneath the arch, notice a wonderful detail: benches built along the walls. Look up, and you'll see it's lined with red brick and divided into arcades of seven arches, each featuring a granite keystone.